One of our award-winning specialities are the production of all types and sizes of galas. Whether you’re hosting a corporate awards gala, fundraising gala, holiday gala or appreciation gala, Eclectic has the creative tool box to knock your gala event out of the park. 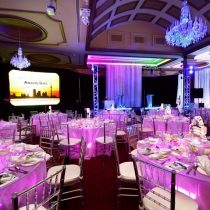 Studying the formula of your gala, we can create minute-by-minute timing, design a stunning event-surround with spellbinding decor and state-of-the-art audio-visual and entertainment that results in thunderous applause time and again… all to create an experience unique to your corporation and of course, to your guests.